For both official probation and deferred prosecution, the responsible person(s) may be required to pay a monthly supervision fee. The fee will be $5.00, $10.00 or $15.00 per month, depending on the financial situation of the family. The fee may be waived in rare cases. This fee may not be paid in advance. For example, if a $5.00 fee is ordered for six months, the responsible person(s) may not bring in a payment of $30.00 the first month. Supervision fees must be made by money order only. Money orders are made payable to WCJPD. If a child is placed on official, court-ordered probation, a court fee of $20.00 may be ordered. The fee must be paid within 30 days of the court date. 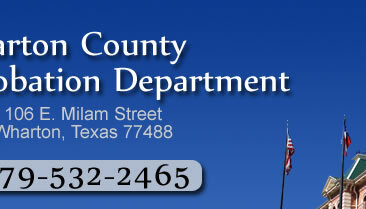 Court fees are paid at the District Clerk’s Office, located at 103 South Fulton Street in Wharton, Texas. When an attorney is appointed by the court to represent the juvenile, the responsible person(s) may be required to reimburse Wharton County for the attorney fee, depending on the financial situation of the family. The attorney fee must be paid within 90 days of the court date. 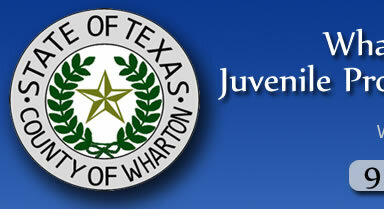 Attorney fees are paid at the District Clerk’s Office, located at 103 South Fulton Street in Wharton, Texas. Should a juvenile be placed on official, court-ordered probation for a graffiti charge, the responsible person(s) is required to pay a Juvenile Delinquency Prevention Fee of $50.00. The fee must be paid within 30 days of the court date. Graffiti fees are paid at the District Clerk’s Office, located at 103 South Fulton Street in Wharton, Texas. The juvenile is required to submit a DNA sample for murder, capital murder, indecency with a child, aggravated kidnapping, aggravated sexual assault, aggravated robbery, controlled or illegal substance felony offense in a drug-free zone and/or controlled or illegal substance offense using a child in commission of the offense, or in an offense for which it is shown that a deadly weapon was used or exhibited. The responsible person(s) is required to pay a $34.00 fee for the collection and processing of the sample. That fee must be paid within 30 days of the court date. DNA fees are paid at the District Clerk’s Office, located at 103 South Fulton Street in Wharton, Texas. When a juvenile causes personal injury, property damage, and/or property loss to his or her victim(s), the victim(s) may request financial restitution. The responsible person(s) will be required to make monthly payments to the WCJPD totaling the amount requested by the victim or an amount determined by the court. The WCJPD will pay the victim the collected restitution. Restitution payments must be made by money order only, payable to WCJPD. Failure to make the restitution payments will result in further court action.